Website Design Shepton Mallet. Are you looking to re-launch your brand on the web, or are you starting a new business in the Shepton Mallet area? Stellasoft is a local Web Design and Development agency which works in the Shepton Mallet area, with our focus on superior website design, and revenue generation we will ensure you won’t be disappointed with the result. We create our websites from scratch, implementing the newest web technologies, designing your website to stand out from the crowd and giving you that superior edge in the market. We have created over 350+ websites for a range of different businesses in Shepton Mallet, we craft everything from brochure websites, landing pages, eCommerce sites, whatever you are looking for, we have the technical talent to deliver. Stellasoft has over 20 years experience in designing, developing and optimising websites, we have a track record of not only building websites, but building businesses. If you are looking for a new website design in the Shepton Mallet area, pick up the phone and call us to discuss your requirements, or you can contact us through our contact form. We focus on the user, our encouraging designs are created to turn visitors into real paying clients. 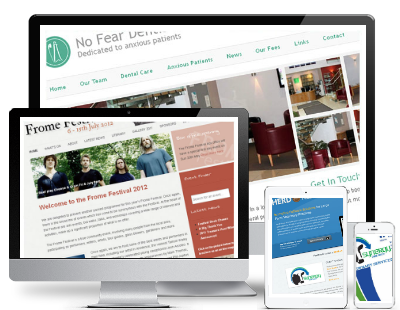 A website designed like no others, with a focus on generating leads for your business. Each website that we create is unique. Created for you, with only your needs in mind. Our content management system (CMS) is designed to put you firmly in control of your content. Making it simple to keep your website and other platforms fully updated, without having any technical knowledge. Our websites are built with your brands personality in mind, our designers will take the time to understand your business and we will implement that process so your customers will too. All of our hosting servers are right here in the UK, guaranteeing you a fast, reliable and secure service. All of our servers are maintained and protected by the latest technologies. Responsiveness is becoming a fundamental feature, we create sites with every device in mind. Did you know 40% of users have turned to a competitor’s website after a bad mobile experience? Some websites may look very attractive, but the code behind the site is poor and it’s impossible to achieve great results. Our developers use code that’s proven to index your site quicker, speed up your load time and works well with a variety of browsers. We design all of our sites with the focus on generating leads, and making your business money. Attracting users and turning those visitors into real paying clients with our encouraging designs. Need a domain for your website? No problem, we will register, configure and get everything running up for you. We’re always happy to talk through our products and services in more details, if you would like to see us in person, no problem! We can arrange to meet that suits your schedule. You are more than welcome to get in touch regarding your website requirements. Stellasoft Rated 4.9 out of 5, based on 105 reviews. “We couldn’t be more chuffed with our new website. Does everything it should, and looks great to boot. We’ve seen an increase in business, and I think it’s safe to say it’s due to the new site.